Woodthorpe Hall located near Holmesfield in Derbyshire is a magnificent listed hall and an absolutely stunning backdrop for a wedding reception. This was the first wedding we have had the privilege to photograph here and would hope to have the chance to do many more. Woodthorpe Hall limit the number of weddings they host each year so landing one of the converted slots can be a matter of good timing and luck, and if you are lucky enough to get one, what a wonderful venue awaits you! In the album spread above we see our happy couple and their guests enjoying the warm summer sun as we worked our way through the family formal photographs. We don't like to spend all day on these as the wedding day is about the couple, not a record of who attended but nevertheless, these images do form an important part of the wedding image collection and help you recall the your happy day as you look back at some point in the future. 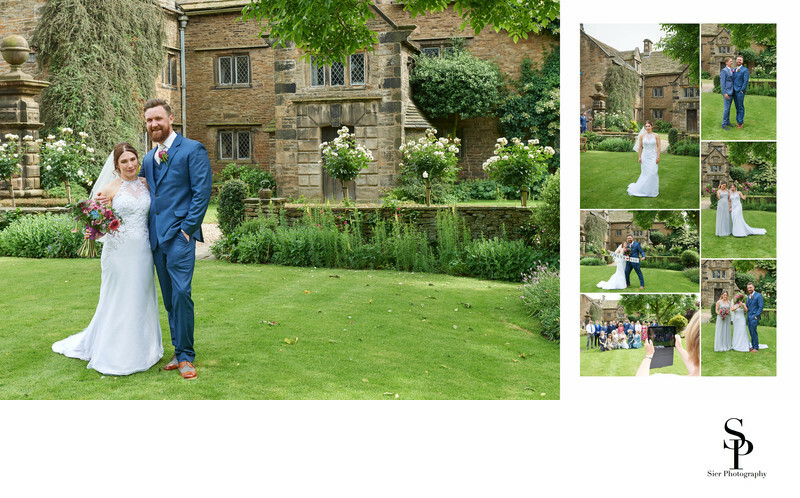 Woodthorpe Hall is a stunning setting for wedding reception in Derbyshire. The hall has some beautiful grounds and provides the perfect backdrop for your wedding celebration. The wedding receptions typically take place in a large marque in the grounds and give a real relaxed and boho feel to the wedding celebrations.